Getting on top of things. The pay differentials of 18th century pirates. Not that I want to reduce Morley to a music-list-making-machine, but I keep meaning to listen to some of the current music he listed here last month, as I’m so out of touch. Talking people on the train are even more distracting and annoying when you realise they're almost exactly the same as you. @synx508 Awww, but it's quite sweet to get a chunk of 20th century delivered every year. 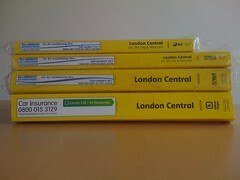 Replaced one old, still wrapped Yellow Pages with a newer, smaller, wrapped Yellow Pages. They are simply memories of how we used to live. Breakfast, Pepys, new office fans, Chart Hits 83, bloggage, ticking things off. Time for the weekend. We've got the washing up situation sorted, but someone MIS-SHELVED A BOOK! Chaos, anarchy and revolution rule in #BRIG. @dorianmoore But when (if) the code finally works, all is good. Phew.